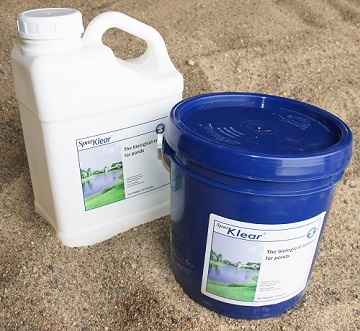 Reduce the nutrients in your pond or small lake. SparKlear® pellets contain bacteria, enzymes, and trace minerals. It is the biological control for ponds and small lakes. SparKlear® is available in pellets or liquid. Use the liquid SparKlear® in our TORMADA™ product application boat. By adding bacteria to the water that are optimized for the pond environment, you can improve the natural degradation of waste products that are typically found in this environment. Bacteria are living creatures that will grow and multiply under favorable conditions, to some degree allowing their population to respond to changes in the quantity of waste products in the pond. Bacterial performance can also be enhanced through the use of enzymes. The enzymes will break down complex compounds into simple ones that are easier for the bacteria to digest. The net result is that the native bacteria in the pond can function at a higher efficiency with the enzyme supplement than by acting on their own. Step 1 - SparKlear® application video. We have used SparKlear for 3 years in our 1/4 acre natural pond. The pond has gotten clearer and clearer each season. 10 yrs ago when we bought our home, the pond was complete muddy - couldn't see fish. First 7 years we used different product line and had nominal results. Finally - SparKlear, fall Phosphorous control, Muckmaid during the season and keeping dye in always - our beautiful fish can be seen swimming from up on our porch! It's still getting better each year.